It was a lazy, get-all-my-groceries-done-at-one-supermarket kind of day, so I was tricked into buying bagels at Save-On-Foods. Supermarket bagels are essentially baked rolls with holes in the middle that aren’t boiled, and look exactly like it. (See IGA’s, for example.) These ones looked OK from the outside, and were on sale. Probably a bad idea, but the mantra of my Bagel Quest is to try bagels from all walks of life. So what the heck. What can I say about this thing? It’s not a bagel. 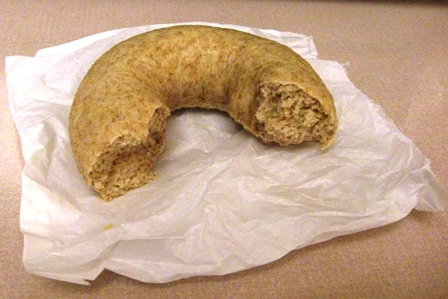 It tastes like nothing – worse than Tim Horton’s plain bagel. Weighing at almost 5oz (that’s pretty heavy for a bagel this size), it is just a really, really dense roll with a hole in the center. I’ve noticed that a Jewish church around my workplace gets bagels delivered from the Mount Royal Bagel Factory. I thought this bakery must make some awesome bagels, for the church to be ordering from so far away (there are other closer Kosher bakeries, I believe, maybe they don’t make good bagels). So I decided to give their bagels a try. As per usual with my Bagel Quest, I went for the plain ones. They’re cute looking- very puffy, fat, and round, with a small little hole in the center. Certainly not “artisan” looking like Siegel’s or Solly’s. And sweet! I mean, literally. 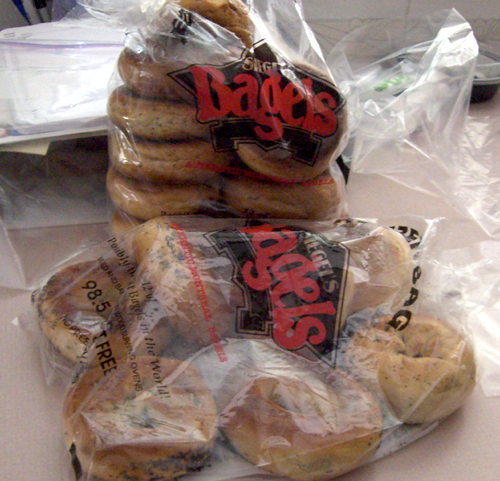 Mount Royal’s bagels smell sweet, taste pretty sweet, feel even sweeter. As in, they are sticky. Never have I touched such a sticky bagel. Must be the malt they used. These are pretty dense, heavy bagels. The crust was not extremely thick, but sufficient. The inside was a bit doughy for my taste. I didn’t like that they were so darn sticky, and I also found them a little too moist. They were decent bagels though, and definitely much better upon toasting (perhaps because that dries them out a bit). Not as good as Siegel’s or Solly’s, IMHO. But maybe because they were packaged and not fresh. Each weighs in at about 3.5oz. They are both slightly sweet and slightly salty. Chewy, and doughy. Crust isn’t too thick. OK bagel, probably one of the better supermarket ones, but definitely nothing like Solly’s or Siegel’s. Most supermarket bagels are just dinner rolls with a hole in the middle, and aren’t boiled before they’re baked. I’m not sure Safeway really boils them, they don’t really feel like they are boiled, but at least they are better than those Dempster’s bagels. A nutritionist might start commenting on how I have not been having the most varied diet. Indeed, I seem to be constantly blogging about cafes, latte’s, and bagels of late. Ah but we can be biased foodies, at least for a while right? Granville Island… It’s a bit of a trip for me and I’ve been there so often that I don’t really end up buying anything interesting at the Public Market. But I still love just soaking in the place. Nothing like coming down here and grabbing a Siegel’s bagel for lunch. Or any other place in the Public Market for that matter. Still, I can’t resist a good bagel. On this visit I also stopped by the Agro Cafe, a popular coffee shop/bistro on Railspur Alley serving organic coffee and food. It’s pretty large and spacious, with seating upstairs and outside. Service is friendly. Usually the outside is filled with people, but it wasn’t busy when I came. I just had coffee, because unfortunately I already ate lunch. They do serve up some nice sandwiches, soups, and snacks though.